"Challenges for the US-Japan Alliance in a Turbulent International Environment"
On Monday, October 27, JCIE organized a major seminar on the future direction of US-Japan relations in memory of the late Jiro Murase, the longtime president of JCIE/USA and a key figure in bilateral relations over the past half-century. 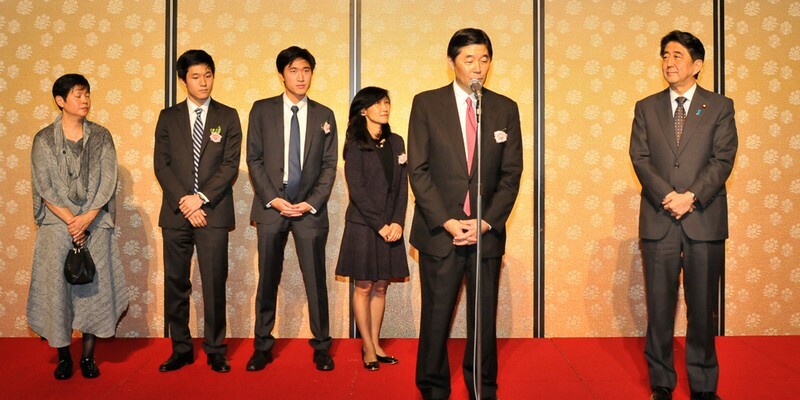 More than 400 senior executives, government officials, politicians, and prominent lawyers gathered to take part in the seminar, which was followed by an even larger reception where Prime Minister Shinzo Abe warmly commemorated Jiro Murase’s contributions to bilateral ties in extended remarks. The seminar commenced with remarks from Ambassador Shinichi Kitaoka about how the work of Murase, often in partnership with JCIE’s late founder, Tadashi Yamamoto, played a critical role in building the underpinnings of the bilateral relationship. Following that, Tsuyoshi Sunohara of the Nikkei newspaper moderated a wide-ranging discussion between CSIS President John Hamre, Ambassador Ichiro Fujisaki, and economist Robert Feldman on the challenges facing US-Japan relations as the balance of power in Asia continues to shift. Several panelists revealed that they feel the US-Japan alliance now is more important than it has been at any time in the past 50 years. However, they also expressed concerns about how US leadership in the region is perceived as wavering, in part because dysfunctional domestic politics in Washington make it difficult for President Obama to exert his power. While warning that the Obama administration seems bound to have an even weaker hand after the midterm elections, Hamre noted that the reservoir of power that the United States has—drawing on its economic, military, and technological clout—should never be underestimated. Plus, while the country is currently deeply divided, one thing on which there is bipartisan agreement is the importance of Asia and Japan. Panelists also spoke about how greater US-Japan alliance cooperation will be needed to cope with the rise of China by steering East Asia in a direction that ensures it remains stable, prosperous, and open, while also working to engage and integrate China more deeply into the regional order. They agreed that one crucial step that Japan and the United States need to push forward on is the quick conclusion and ratification of the Trans-Pacific Partnership trade deal, although there were differing opinions about whether an agreement could actually be reached. And they emphasized the importance of cultivating human ties between countries, much in the way that Murase did throughout his lifetime. The reception that followed commemorated the life of Jiro Murase, who passed away in August 2014. The founder of one of the leading US-Japan law practices at Bingham McCutchen Murase, he played a prominent role for many years on the boards of JCIE/USA, the Japan Society of New York, and many other US-Japan organizations. He also served on the US President’s Advisory Committee for Trade Negotiations and advised a wide range of Japanese and US leaders. At the event, his son, Satoru Murase, announced that a new scholarship, the Jiro Murase Scholarship, would be established with contributions from the Murase family, the US-Japan Foundation, and other donors, to carry on his legacy of building ties between Japan and the United States. This scholarship will be administered by Beyond Tomorrow, a Japanese nonprofit organization.